F&W’s Christine Quinlan researched dozens of grills to figure out how to get the most for your money. 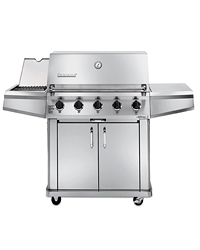 Most $300 grills are made of a combination of metals, such as aluminum and steel, but if you search, you can find all stainless steel, which is more durable. When you’re shopping for a grill, give the cart a shake to be sure it’s solidly constructed and doesn’t rattle. 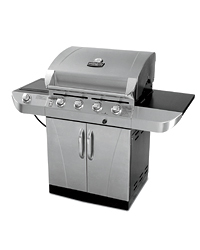 Grills at this price typically have two plastic wheels rather than more durable rubber ones. Tip Gas tanks are usually sold separately and cost an additional $25 to $30. 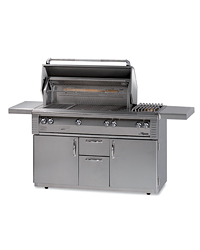 Grills in this price range usually have two or three U-shaped or circular burners, but you can find grills with tube-shaped burners, which run the length of the grill and thus heat more evenly. Side burners—stove-style gas burners on a shelf next to the grill—aren’t standard at this price, but if you scout around, you’ll find some models that have them. Also called grids, these are the grill’s cooking surface. There are several options: Look for stainless steel or porcelain-coated cast iron, which are more durable, sear better and heat more evenly than steel or porcelain-coated steel. Tip Porcelain coatings can chip, allowing the metal underneath to rust, so on these grates, use brass-bristle cleaning brushes instead of stainless steel ones. With about 350 to 400 square inches of primary cooking area (the main grate), these grills are big enough to cook for four people. Beware of the term total cooking area; that measurement includes the warming racks and side burners. Between one and five years on certain components, like the lid. Broil-King, Char-Broil, Charmglow, Fiesta, Kenmore, Weber.